This smart Hong Kong detective story plays it loose, but a stiff production keeps it from taking off. 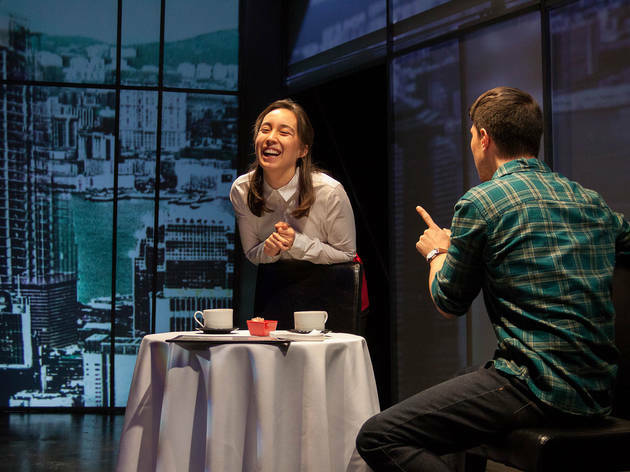 Candace Chong’s Hong Kong-set play Wild Boar (adapted here by David Henry Hwang from a translation by Joanna C. Lee and Ken Smith) mixes its genres in a style not unlike the odd “one country, two systems” status of Hong Kong itself. 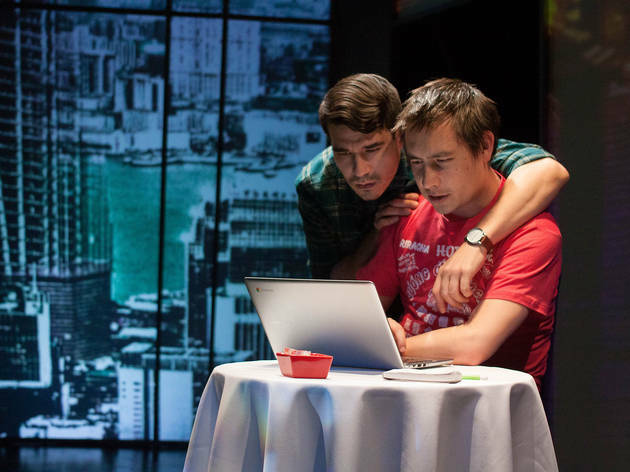 The play is a mystery thriller, a romance, a wry comedy and a semi-dystopic parable that eerily suits the current political moment. 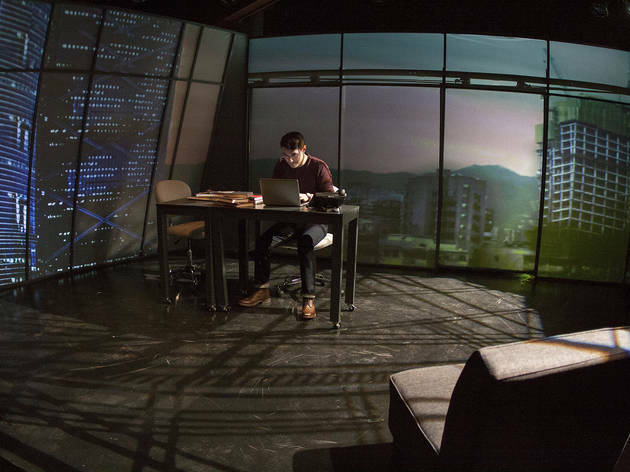 The mixture isn’t a fluid one; sometimes it’s more like a jumble of tones and cliches with unappetizing lumps and bits that get stuck in your teeth—an issue exacerbated here by director Helen Young’s wan, ambling production. 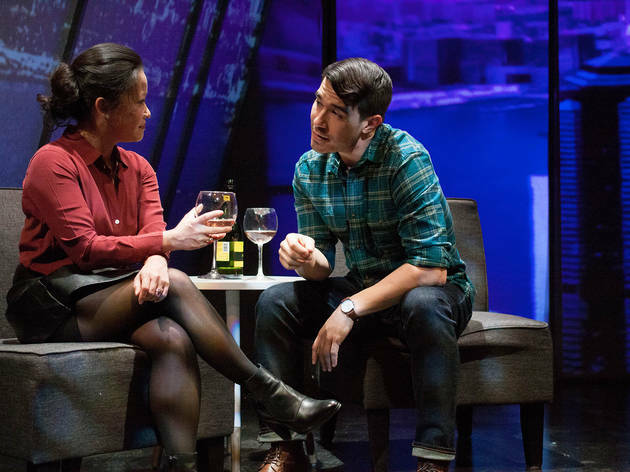 A more defined rendering of this play might leave the audience with feelings of whiplash, but the problem here is that the performances are stiff (though so are Hwang’s lines), the scenes mushy, the specificity of the characters’ lives almost entirely absent. In a story where characters are constantly wanting to shout things from the roof, major revelations and emotional beats mosey on by with an almost feline casualness. And yet, though this production might leave you drowsy, the play itself can’t help but wake you up. 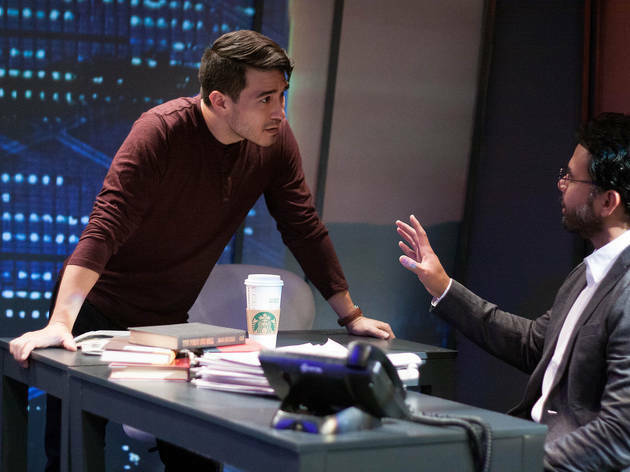 In its concluding moments, when the script’s disparate elements snap into place, the play still offers a chilling warning about the temptations of security and stability, especially when they’re presented as the toll that a society must pay in exchange for giving up its freedom. Read that previous sentence again, and you might realize that it plays well on either end of the political spectrum. And, indeed, one of Wild Boar’s strengths is the ways in which it muddies the partisan waters. 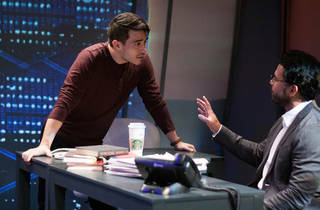 The play begins with the disappearance of an esteemed professor and oral historian, Mu Ne (Fin Coe)—an event that prompts prominent journalist Ruan (F. Karmann Bajuyo) to resign his post and start an independent paper to take on the powerful interests that want to keep the whole thing quiet. 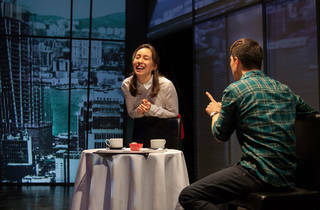 He brings along his wife Tricia (Christine Bunuan), a photojournalist, as well as his old protege—and Tricia’s former lover—Johnny (Scott Shimizu). The younger Johnny, meanwhile, wrestles with his own feelings of ambivalence and rekindles a romance with an old flame, Karrie (Emily Marso). He also works with his old friend Yam (Coe), a hacker who helps the paper uncover the source of Mu Ne’s likely abduction. It has to do with multinational conglomerates and a plan for a “new city” that involves sending the poor underground. 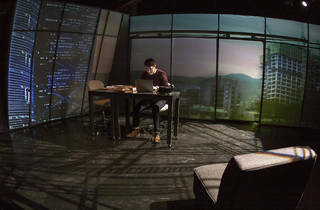 The story’s sweeping, civic scope is served well by designer Yeaji Kim’s set, which consists of a series of screens onto which are projected various backgrounds, most of them cityscapes. A new building, the proposed center of this “new city,” is always visible, looming like a threat sent back from the future. 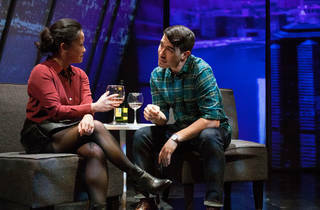 The moment where the play begins to turn its assumptions on their head is during a mid-story conversation between Ruan and Karrie. Ever the crusading journalist, he is eager to publish his findings, entirely sure that the “common people” will be incensed and that the the project will be halted. Karrie informs him that, as one of these “common people,” she can assure that they don’t care. This “new city” stands to benefit them. They want a better life, even if it’s a subterranean one. Even in a production that has trouble landing its big moments, the scenes like this still manage to deliver a jolt. Silk Road Rising. By Candace Chong. Translated by Joanna C. Lee and Ken Smith. Adapted by David Henry Hwang. With Christine Bunuan, F. Karmann Bajuyo, Fin Coe, Emily Marso, Scott Shimizu. Running time: 2hrs; one intermission.